Thank you for taking the time to read our Autumn Newsletter. Greetings to our new readers and a warm welcome back to our loyal readers. Thompson Longhorn has had a very exciting start to the year with multiple new major projects underway, along with current projects drawing to completion. During the next few months we are also proud to be sponsoring multiple events including the Adina Polocrosse World Cup. The Polocrosse event will be held in Warwick from the 22nd - 28th of April 2019. Our Sales Team will be at our trade stall for the duration of the World Cup Polocrosse event and are eager to speak to you about why choosing Thompson Longhorn for your yard upgrade is the best decision. Ex demo equipment will also be on display available for purchase. During the event we will also be sponsoring the Thompson Longhorn Barastock Interstate Series Team Meet and Greet and attending the auction on Friday the 26th to auction cattle handling equipment. Biggenden Saleyard is drawing to completion which has been one of our major projects over the last 12 months. Continue reading to see progress photos and interesting facts about the project. Biggenden Livestock Exchange has been a massive project we undertook and estimated completion for the end of March. The construction of the saleyards includes demolition of the old yards, design of the new yards along with construction and installation. The construction was completed on schedule with no major issues. During the construction local businesses were utilised to ensure the timely completion of the project. Please see below a few facts about the saleyard rebuild along with multiple progress photos. The saleyards have been an extensive project for Thompson Longhorn over the past 12 months. Rebuilding saleyards presents many challenges as the yards are normally still in operation and construction must allow for these sales to proceed with no interruption. The saleyard will be completed by the end of the month. Thompson Longhorn is now offering onsite service for Thompson Longhorn equipment. Our field service team is available to come to your property and service equipment and provide a service report. The service report will include information on repairs and ongoing maintenance required for your equipment. An obligation free quote for any parts required will also be provided. To express interest or gain more information on upcoming service trips in your region please email sales@thompsonlonghorn.com.au or call (07) 4666 6174. Service visits will be charged at a flat rate if visit occurs during a designated service trip. If the visit is not during a service trip travel costs will be charged along with service fee. Conditions apply. Here at Thompson Longhorn we pride ourselves on our ability to provide innovative design solutions for any customer in any situation to accommodate the best cattle movement efficiency possible. A prime example of such a design which we have recently been implementing with great success for weaning and feeding operations is our Easyflow holding pens. Our free eBook outlines some of the perennial challenges and questions that you may face when you are looking to invest in new equipment or yards. We understand that this can be a confusing and complicated process, our eBook shows you how we can make the process easier for you. We welcome you to visit use to see our automated trade display and our robotic welding facility. Our factory is only a 50 minute drive from Toowoomba. 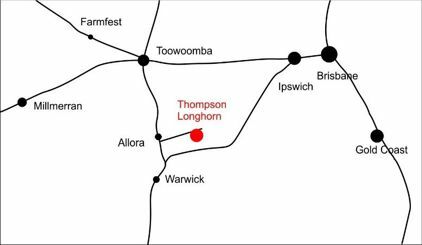 Simply turn east just south of Allora at the Goomburra turnoff and 12.5km later you will be at Thompson Longhorn. An appointment is necessary for factory tours. To book an appointment please call us on (07) 4666 6174. BURNETT Livestock’s new $3.7 million Biggenden saleyards are on track for the scheduled March 29 completion date. Already in operation, the innovative yards feature 390 selling pens, a sophisticated cattle processing facility, a dip, and a double deck loading ramp. Thank you for taking the time to read our Spring Newsletter. Greetings to our new readers and a warm welcome back to our loyal readers. Its nearly our favourite time of the year; Rodeo time! If you haven’t been to the Warwick Rodeo it’s definitely something to put on your bucket list. The event is held on the 22nd – 28th of October at the Warwick show grounds and brings to town the best of the best. Filled with horseman, bronc riders, bull riders and much more Warwick Rodeo and Gold Cup Campdraft is the highlight of the year for many. Last year the event exceeded expectations with nearly 35,000 people through the gates over the event. It is not an event to be missed! Thompson Longhorn are proud to announce we are Gold Sponsors of the Rodeo again this year and we absolutely love the opportunity to attend. All cattle are processed through Thompson Longhorn equipment which is a perfect opportunity to see our core operating centre in full action. Don’t forget to stop by the Thompson Longhorn trade stall to say hi! Have you ever seen our core equipment, (crowds, races, ramps, and so on) and wondered if you could change those stairs out for ramped catwalk, or load out of that race? You can, and we thought we could share a few examples of recent customizations. This is our 360° Pneumatic Nearside Crowd, as the name implies there are quite a few variations; 270°, 180° (rather than 360°), Manual (rather than pneumatic), Offside, and different combinations of those. The stairs that you see coming off the catwalk can also be moved around the crowd to better suit your yard, or indeed replaced by inclined catwalks. This is our Parallel Non-Sheeted Curved Nearside Race, and the name gives it away again-there are plenty of variations; Vee-profile (rather than parallel), Half-Sheeted, Full Sheeted (rather than Non-Sheeted), Straight, Offside, and a variety of combinations of those. All of those come with break out gates in every section, but what if you want to load out of your race? You can, and we’ve done so at both the start and the middle of our curved race. In both cases a gate directs cattle either to the load out or through the race. This is our Double Deck Ramp, which is always great to customize. Do you really only need to unload, then we can remove the sorting gate from the bottom. Do you have an unusual yard layout and you just can’t fit the standard straight ramp, may we suggest kinking the ramp. Does your site have multiple levels, use your ramp to best advantage spanning between your yards and road heights. Some would say that there isn’t room for improvement in headbail design, here at Thompson Longhorn we respectfully disagree. There are a lot of variations on Headbails, but most fall into two types; vee doors and parallel doors. Vee Headbails have both doors rotate to open and close, pivoting off the bottom of the headbail frame, so the bottom of the doors close faster than the top. That is you can close the doors enough to catch the shoulders, and still leave room for the animal’s head between the doors, reducing the risk of missed animals. However, the pivots mean that even when the doors are fully open, the bottom of the headbail isn’t clear, and therefore cattle can feel forced to jump through. Parallel Headbails on the other hand have both doors slide to open and close, typically using wheels and runners at the top of the doors. Which means there is nothing in the way when the doors are open. However, the top and bottom of the headbail close at the same time, so animals must be caught after they reach the headbail. Which led us to the question, why not combine both and create a Parallel-Vee Headbail? Of course, it wasn’t quite that simple, but it does work. As the doors first start to open, they mostly rotate, and as they open, they begin to mostly slide, keeping the pivots out of the way, without losing the catching convenience of the vee headbail. While taking the Parallel-Vee Headbail from concept to product, we decided to make a few other changes, starting with adapting the manual version to make it much easier to use, and ending with changing the name to para-vee. Thanks for taking the time to check in on our Autumn newsletter. In December, we were hoping for the predicted above average summer rainfall for the north to materialise. What a mixed bag of surprises Australia actually received?! Despite continual weather challenges the industry has generally remained positive and it has been encouraging to see continued innovation. In 2014 Thompson Longhorn pioneered the use of drones for the purpose of collecting existing cattle yard site information and then utilising the data to redesigning and improving safety, welfare and efficiency. Since Christmas, two separate and non-related projects have kicked off that may offer break throughs to monitoring livestock behaviour and livestock feed optimisation, one utilising drones. Along side these innovative studies, recent research has identified that further opportunities can be realised in the feedlot sector by increasing automation levels (click here to read more). Last year we witnessed several red meat processing automation projects announced, which show plenty of promise (click here to read more). It is hard to explain how exciting it is to be involved in such a progressive and positive industry, despite the continual challenges. There is little doubt that Australia punches well above it's weight on the global stage and in many cases leads the world in livestock management technology. 'Auto drafting' is a term that has become much more commonly used within our segment of the industry in recent years, but what does the term actually mean? Most cattle producers have heard of the concept, but individual interpretations can be quite varied. In more recent years we have seen a maturing of this market segment, and as a result it is not surprising that some clarification of what automated processes are now available to 'auto-draft' animals is past due. For almost 20 years, Thompson Longhorn has specialised in building automated cattle handling equipment. During this time, we have delivered widely varying degrees of cattle yard automation. It could be argued that automating a gate(s) in a lane draft or pound yard with a pneumatic (or less commonly used hydraulic) cylinder produces a basic level of 'auto-draft'. Whilst these innovations offer great improvements to operator safety and animal welfare, this mechanisation is not an 'auto-draft'. This is a fairly common misunderstanding. The second misunderstanding is that your new scale head, RFID reader or field computer running herd management software can somehow take physical control of your mechanised gates - aka 'auto-drafting'. These important and intelligent management tools are definitely a critical part of the process but have no ability to directly make any gate move. What these devices do extremely well, is combine real time data collection (weight, RFID, historical animal information) with user defined sorting rules to give the operator accurate answers, at a speed and level of accuracy that is not humanly possible. An 'auto-drafter' is the missing link that ties your mechanised gates and smart crush side data processor together by listening to the code coming from a scale head or PC and being able to then take control and make gates move. Mechanisation of the hardware: actuators or powered cylinders connected to the drafting gates and perhaps the entry and exit gates to the RFID scanner/weigh box, and the ability to control these gates electronically. The automation of the draft choice: a computer-generated draft choice based on live and pre-programmed criteria. Typically, this is performed by a smart scale indicator with draft capability, PC based herd management software or an intelligent RFID reader (as in a drafter used to separate non-reading animals for re-tagging). 'Auto-draft' controller - realising the value of the system: once the draft choice has been made in the scale indicator or PC, the computer code needs to be translated and then used to generate electronic signals (usually 24-volt DC) that can be sent to gate control solenoids. This device has varying levels of intelligence available and can sequence events to ensure that other draft gates are closed before opening a new gate or that the draft gate is open before releasing the animals from the scanner/weigh box. Autonomous drafting (look mum, no humans!) can also be achieved via adding animal location sensors to the system so that the auto-draft controller knows where the livestock are within the system at all times. So, when is some form of cattle yard automation warranted? One might think that business (herd) size would be a determining factor to work out who does and does not adopt these newer technologies - not true. We have instead witnessed a trend of adoption from organisations and individuals who have taken a longer-term view of their businesses and have made deliberate steps towards improving operator safety, animal welfare and reducing operating costs (labour saving). Time and again it has been proven that simply starting by automating drafter gates, is well worth the the expense for most cattle producers. At the other end of the scale, most commercial feedlot operations use livestock management software and require drafting animals on recorded historical data (like veterinarian withholding periods, home pens etc.). RFID makes this possible but the sequencing of various pieces of automated equipment, scanners and sensors using an auto draft controller, makes true auto drafting a reality. Here at Thompson Longhorn we love to design innovative equipment to make your work life easier, safer and more efficient. Often this process starts with a seemingly simple question like, "Can I have a restrainer that is also a tipping table?" The simple answer is yes you can. Another question worth asking is "Why?" you would want a Tipping Restrainer. Two main reasons; you only need to catch your cattle once, and you only need to maintain one piece of equipment. Such a versatile piece of equipment is an interesting challenge in many ways, especially keeping all the features of a restrainer, when upright, and sufficient hoof access when tipped. Of course, we also want to ensure that we provide easy to use, safe solutions for both workers and cattle. Our design team is working on a hydraulically powered Tipping Restrainer, to reduce the heavy lifting, and offer features like powered leg grabs. Which are designed to make the process of hoof trimming as easy and safe as possible. The idea is simple, encourage each leg to the nearest grab, push a button, and the hydraulics do the rest, holding each leg in place until you are finished and release them. We have kept a dual squeeze system, to keep your cattle comfortable and safely restrained, both when tipped and upright. A dual squeeze system also means that you can raise and lower tipped animals, to a safe and convenient height for your workers. Both squeezes are shaped wider at the belly of your cattle, to better hold each animal from shifting, especially when tipped. Which also helps animals to be tipped back onto their feet. Very soon we will be enjoying the next most exciting phase - physically building a prototype and testing it out. A review of feedlot induction processes in the lotfeeding industry has revealed opportunities to introduce automation at key points of the process to improve safety, efficiency, and reduce costs. Payback on some applications could be less than three years, researchers found. Congratulations to Thomas Green for receiving the ALFA Young Lot Feeder of the Year award. Thompson Longhorn is proud to be one of the many sponsors for the Paddock to Palate. Thompson Longhorn provided the RNA with one of our pneumatic restrainers - Monarch MkII - to be part of the Cow Paddock display at the 2017 Ekka. The display is aimed at entertaining the general public and showing real examples of cattle handling. This is a great initiative for reducing the gap between the city and the bush and allowing the city folks to see how cattle are handle and treated in a safe way. Bringing the country to the city - our Monarch MkII showing the public how cattle are handle in yards. 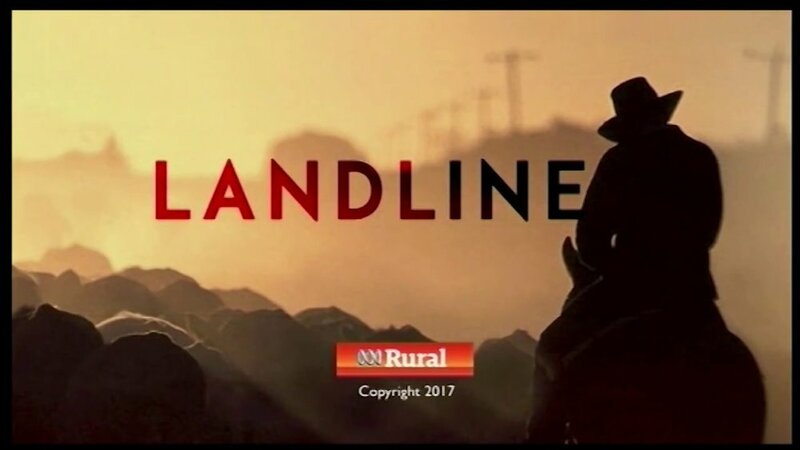 A good example of the capacity expansion currently being seen across the lotfeeding industry is a project at the Iranda Beef feedyard near Tintinara, about two hours east of Adelaide in South Australia. Shane Webcke has been travelling around the state interviewing industry experts about overcoming issues on Queensland farms.